Hearing is arguably one of the best of the senses. It allows us to receive important oral communication, as well as to fully enjoy more artistic mediums like music, movies, and television. It can also help warn you of oncoming danger, which is especially true in our modern world. When our sense of hearing is decreased—or totally lost—it not only affects the things we discussed above, but it could also throw off your equilibrium and balance. This is why acoustic neuroma can be a scary thing, especially when you don’t know all of the details behind it. But, have no fear; we are here to inform and help. We’re going to take a look at everything acoustic neuroma. From acoustic neuroma causes and acoustic neuroma symptoms to acoustic neuroma diagnosis and acoustic neuroma treatment, we will demystify acoustic neuroma so that you know what it’s about, what it can do, what to look for, and hopefully how to stop it before major damage has been done. What exactly is acoustic neuroma, and how is it caused? Acoustic neuroma (also known as vestibular schwannoma), for all intents and purposes, is a brain tumor. The good news is that the tumor is benign, meaning it’s not cancerous. The bad news, however, is that the tumor forms on the eighth cranial nerve. The eighth cranial nerve runs from the brain to the inner ear canal, and it’s the system that helps with balance and equilibrium. The tumor presses on the nerve, interrupting the transmission of the signals that carry sound from the inner ear to the brain. As to what causes an acoustic neuroma, we aren’t sure as there are no common causes. The closest evidence we have for a common cause is that one out of 100 sufferers of neurofibromatosis type 2 (or NF2) will develop acoustic neuroma, but it should be noted that neurofibromatosis type 2 is rather rare in itself because it only affects one person out of 350,000. It’s not uncommon for an acoustic neuroma to form on the eighth nerves on both sides of the head affecting both ears. 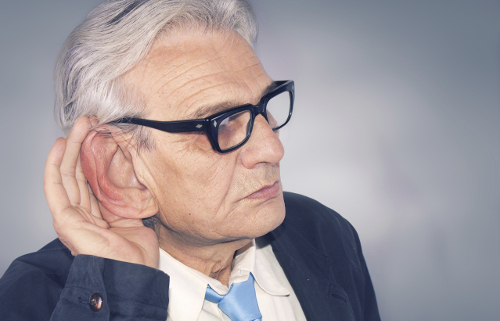 The hearing loss tends to be gradual as opposed to just a sudden stop in your hearing. About seven in 10 people with an acoustic neuroma have tinnitus in one ear. Essentially, tinnitus creates a sound with your ears despite no sound actually being created in the world. This sound can range from a high-pitched whine to a dull ringing. This is a symptom, not an actual disease. It should be noted that tinnitus can be caused by many other things beyond acoustic neuroma-like ear infections, earwax, and aging. Vertigo is a form of dizziness due to a sense of movement. This sense of movement can happen even if you aren’t moving. One in 10 sufferers of acoustic neuroma will have this as their first symptom, and half of acoustic neuroma sufferers will gain this symptom. The pressure of the acoustic neuroma on the eighth cranial nerve can also put pressure on another nerve called the trigeminal nerve. The trigeminal nerve controls the feeling in your face. Other less common symptoms can include issues with your vision, earaches, headaches, and tiredness. It’s important to keep these symptoms in mind when seeking a full diagnosis. As with most medical issues, a doctor will begin to make a diagnosis by discussing your symptoms and recent medical issues. This is to rule in and rule out possible issues for your hearing loss. A hearing test may also be administered to assess the extent of the hearing loss. If the doctor feels that your hearing loss may be the result of acoustic neuroma, they will most likely suggest a medical imaging test like an MRI to see if a tumor has formed by the eighth cranial nerve. After a diagnosis of acoustic neuroma is confirmed, treatment can be recommended. Now, while a tumor is nothing to scoff at, in the case of acoustic neuroma, surgery is not needed immediately. It will grow slowly and will not spread outside the brain. The visual imaging tests can confirm the size of the tumor. If it’s still a fairly small size, radiotherapy—specifically stereotactic radiotherapy—may be used to shrink the tumor instead of surgery. This is usually done over three to 10 sessions. If the stereotactic radiotherapy is unsuccessful or the tumor has become too large, surgery to remove the tumor may be recommended, usually in conjunction with stereotactic radiotherapy. The treatments do come with a number of risks and possible side effects as minor as infection and as major as nerve damage that can then have other effects. If the trigeminal nerve is affected, permanent facial paralysis is a possibility. Acoustic neuroma can be scary when you first hear about it. It’s not only a tumor but a brain tumor and a brain tumor that threatens to take away your sense of hearing. Overall, that’s a pretty frightening description. But fortunately, it’s not that bad. Acoustic neuroma isn’t cancerous so the tumor won’t spread to other parts of the body. While there are risks, acoustic neuroma is easily treated with stereotactic radiotherapy and surgery. Finally, if caught and treated, the outlook for a patient with an acoustic neuroma is very good and depending on when the tumor is caught and treated, very may be little in terms of resulting hearing loss. So if you begin to suffer from the symptoms of acoustic neuroma, don’t wait for it, go see a doctor and get a diagnosis as soon as possible. “Acoustic Neuroma,” NORD National Organization for Rare Disorders; https://rarediseases.org/rare-diseases/acoustic-neuroma/#causes, last accessed June 5, 2017. “Acoustic Neuroma,” Patient; https://patient.info/health/acoustic-neuroma-leaflet, last accessed June 5, 2017. “Acoustic Neuromas,” We Are MacMillan Cancer Support; http://www.macmillan.org.uk/information-and-support/brain-tumours/understanding-cancer/types-of-brain-tumour/acoustic-neuromas.html#155236, last accessed June 5, 2017. “Acoustic neuroma (vestibular schwannoma),” NHS, April 4, 2016; http://www.nhs.uk/conditions/Acoustic-neuroma/Pages/Introduction.aspx, last accessed June 5, 2017.